Now you can play us.888poker face2face on the NEW Pokercam tables. That’s right - you can see players from all over the world at specially selected us.888poker tables. It’s REAL Poker, REAL People and REAL Cash. So, are you ready for PokerCam? On these brand new and exciting tables you will be able to play cash games with your friends or other players in our poker room via webcams. Choose a PokerCam table according to your favorite stakes level (look for the PokerCam icon next to the table name) and double click it. Once the table is opened, click on one of the available seats in order to join the fun. Your webcam and microphone will be enabled automatically once seated on the table. That’s it! You are in. Upon playing on these tables, the player is required to behave moderately and non-offensively, in order to keep the enjoyment of other people and themselves around these tables. Accounts of players that attempt to use the video for advertising or promoting commercial or private interests may be suspended indefinitely. 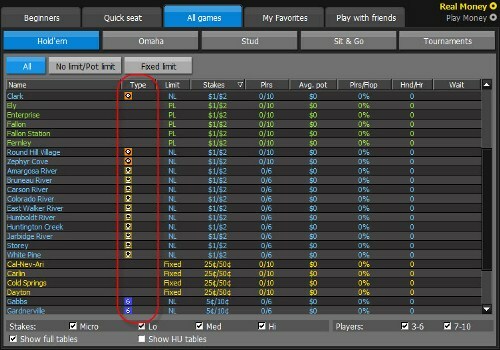 Players that are sitting out in a PokerCam table will be removed from the table in order to make room for players that are waiting to be seated. us.888poker reserves the right to limit the number of players "viewing" the PokerCam tables and change this number from time to time. us.888poker reserves the right to ban a player from the poker room or take any necessary action or penalty in cases of a player’s misconduct around the PokerCam table. For more details, read the full us.888poker terms & conditions. Can I sit on a PokerCam table without a camera? In order to play on our PokerCam tables you need a camera connected to your PC. However, if you don’t have a camera you will be able to view the action on the table, but not to join. Can I sit on two PokerCam tables at the same time? No. Due to limitation of webcam devices, you will be able to sit (broadcast) on a single PokerCam table only. However, you can sit on one table, and become a viewer in others if you wish to do so. Can I play on other tables while playing on a PokerCam table? Sure. There is no problem to play other us.888poker tables while playing or viewing a PokerCam table. Although the table is opened by default to full screen, you can resize it in order to see other tables too. Alternatively, open the Table options menu on the upper-right corner of the screen and choose Cascade or Tile. Can I share the camera on the table with another video application like Skype or Messenger? No. Due to limitation of webcam devices when you sit on our PokerCam table, you won’t be able to start another video conference using Skype or Messenger. I have video quality problems. What can I do? If there are video quality problems, there's a good chance that it is due to an Internet bandwidth problem or a computer processing problem and the quality of the audio and video during a PokerCam table session may be affected. It may also be affected by your computer's hardware (CPU and RAM which are used to process the video). 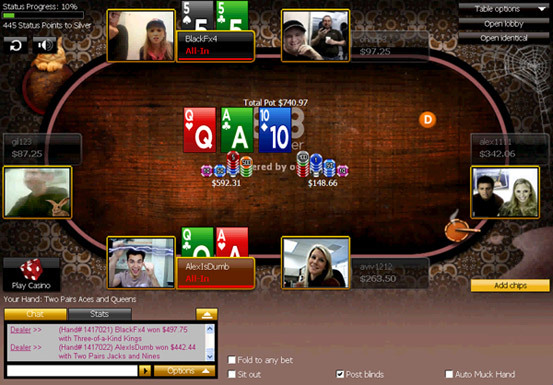 More bandwidth and CPU usage are required as the number of players around a PokerCam table increases. Check if you are sending or receiving e-mails with attachments or uploading or downloading large files (some applications run in the background to download music, video clips, auto-file backup, etc.). If more than one computer is connected to the same Internet line, check if another computer is being used to upload/download files or send/receive large e-mail messages (or even if a cell phone or other device is connected to your wireless Internet connection). I have webcam problems. What can I do? ü Check if your camera is being used by another application (including the camera’s own picture taking software). In this case you will need to close the application(s) and also close the PokerCam table and re-open and re-join the table. Check that your camera is connected to your computer. If the camera was installed and/or plugged in after loading the poker application, close the application and re-launch it again. If the problem was not solved, try replacing the camera. My video picture’s quality looks poor. What can I do? Check your lighting. The lack of proper lighting is accountable for half of the picture quality problems. Make sure your face is well lit and that there are no direct lights behind you. Check if you have a good webcam. A good quality webcam can make a difference. We recommend using a webcam from a known brand. Is there a limit to the number of people who can watch a PokerCam table. Yes, there is. In order not to overload these tables we limit the number of viewers that can watch a game, so you may occasionally see a message asking you to wait a few moments to access a table. Can I block the video of another player on the table? Sure. If you wish to avoid seeing one or more video streaming of players around the table, simply right click on the player’s box, and choose the Block Video option in the menu. The video will be blocked until you will unblock it using the same way. How can I add video effects to my video? Third party program that includes video effects – if you install such a program on your computer, it can function as your video device. Video effects may also be included with your webcam software. If it is, you can start it from the camera manager utility after the video is displayed. Can I resize the PokerCam table window? Yes. PokerCam tables are opened by default on full screen to get you the best video experience. However, if you don’t want the table to occupy the full screen; just drag it from one of its corners and reduce it to the desired size. Can I use cameras or Camcorders with a Firewire connection? These types of cameras are not designed for Internet video (like standard webcams). Therefore we recommend using a webcam. There are applications which may enable you to use these types of cameras by simulating a compatible driver. However, these applications have high CPU usage and will probably adversely affect the video performance. How can I use the Microsoft LifeCam HD camera? Scroll down and uncheck the TrueColor checkbox. Close the Lifecam window and test the camera on our PokerCam table again. Do I need to have broadband Internet access? My CPU usage looks high. What should I do? What is the minimum amount of bandwidth required for a PokerCam table? A minimum of 128KB of available bandwidth is required for the upload and download (including the audio and video). For each player that is joined to the PokerCam table, more download bandwidth is required (to download the video on the other participants’ side). The video quality depends on the available bandwidth the players have. If there is more available bandwidth, then the video quality will be better. How can I increase my microphone volume so people can hear me better? During a game on a PokerCam table your microphone volume will be adjusted automatically and your opponents can adjust their speaker volume during the game. However, if you need to adjust your microphone volume manually, simply double-click the Audio icon in Window’s notification area and move the microphone slider to adjust your volume. How can I increase my speaker volume so I can hear better? Use the speaker volume slider in the Volume Control panel (accessed via the Audio icon in the notification area) to adjust your speaker volume. We also recommend the use of a headset with built-in microphone for best audio quality. How can I mute myself during the game? In case you would like to have a private conversation during the game, simply double-click the Audio icon in Window’s notification area and check the Mute option under the microphone column. Don’t forget to uncheck it once you want to revert this action. How can I mute others during the game? If the talking around the table interferes, you can take a time-out by pressing the Mute button on the upper left corner of the screen. When you are ready, click the Mute button one more time to hear everyone again. Please bear in mind that this option does not mute yourself (see 10), and others will be able to hear you. I have speaker problems. What can I do? Check that your headset or speakers are connected to the speaker plug on your computer. If you’re using speakers make sure that they’re plugged-in and switched on. Check if your speakers are being used by another application. If so, then close that application. I have microphone problems. What can I do? Check that your microphone is connected to the microphone plug on your computer. If you have more than one microphone, try selecting a different microphone from the 'Settings' window. Verify that your sound card is working properly (by playing a song or sound from another application). If the problem was not solved, try replacing the microphone. I cannot hear the other player/s on the PokerCam table. What can I do? Check that your headset or speaker devices are not muted. Check that your headset or speakers are connected correctly to your computer. In the PokerCam table window, make sure there is no red mark on the speaker’s button. If there is, click on the button to un-mute. Our PokerCam table has a built-in automatic echo cancelation mechanism but an echo may occur when one or more people in the conversation are using a set of speakers instead of a headset. It is caused when sound from the speakers is picked up by the microphone. If you prefer to use a set of speakers instead of a headset, try to position the speakers in such a way that the sound is not aimed in the direction of the microphone. You can also lower the speaker volume on the set of speakers which is causing the problem. The echo can also be caused by other participants. Try having them mute their microphone to see if the problem is at their end. The echo cancelation is also affected by background noise around you (it works best when you're in a quiet setting).